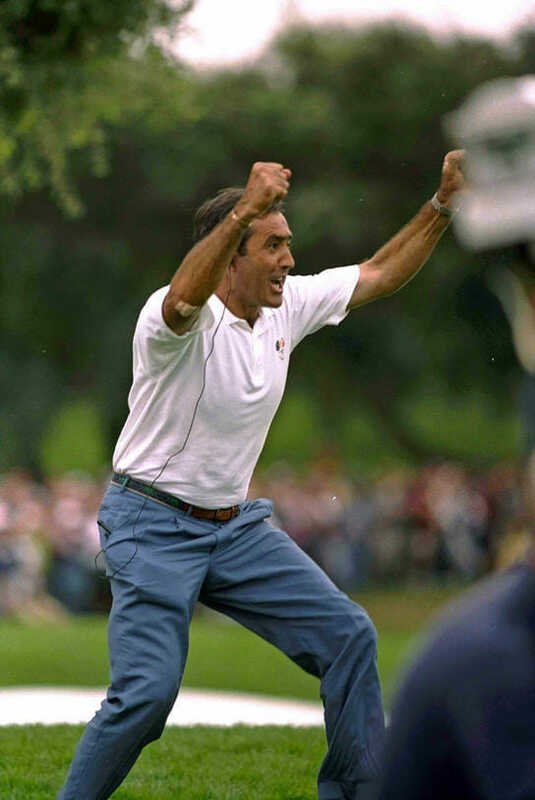 When I managed Seve during his Ryder Cup captaincy at Valderrama in 1997 it was an absolute nightmare. I will never forget the whole experience. The plan was simple; bring every fairway in to 15 yards wide at 260 yards and make it U.S. Open tough. He would then have private conversations with the greenkeeper about how much water for certain greens etc. It was a brilliant plan as it took away the Tiger’s prodigious length advantage he had at that time. His plan for the week was to win 14 ½ points. That was it. He trusted his Matadorial instincts and his years of mano a mano combat experience to pick some inspired pairings, most notably the emerging Sergio Garcia and Jasper Parnevik. Mark (Jesse) James and the not so chilled out cigar smoking Miguel Angel Jiménez by the end of the week were his frazzled Vice Captains. The week of the event was chaos but always passionate chaos. He told Richard Hills, Ryder Cup Director on arriving on the Sunday night that he wanted single beds in the rooms with the married couples. He did not want them running out of stamina by Sunday! He requested that the soles of the new Hugo Boss shoes should be scraped with a knife so that a player would not slip while walking to the Opening Ceremony. He almost had a fist fight with Darren Clarke in the locker room midweek. He wasn’t speaking to Woosie for two days and he was driving the players mad (especially Monty) by almost telling them what shots to play on certain holes. I remember phoning my father for help on Wednesday, telling him it was out of control and I was afraid that the players would turn on him if Europe lost and destroy the Seve brand. He gave me the best advice I could have asked for, ‘stay out of the way, son”. I did. I was sitting in San Roque Hotel on Sunday night at 11:30pm during the celebrations with an exhausted Colin Montgomerie slouched on a big soft chair. He had performed the herculean task of winning the final match for Seve as he prowled around him on almost every shot towards the end. My phone rang; it was Seve calling from his room. “Roddy, call Ken Schofield (Head of the European Tour) and tell him I will never be Captain again”. He knew how close he had come to losing. However this American team is different. 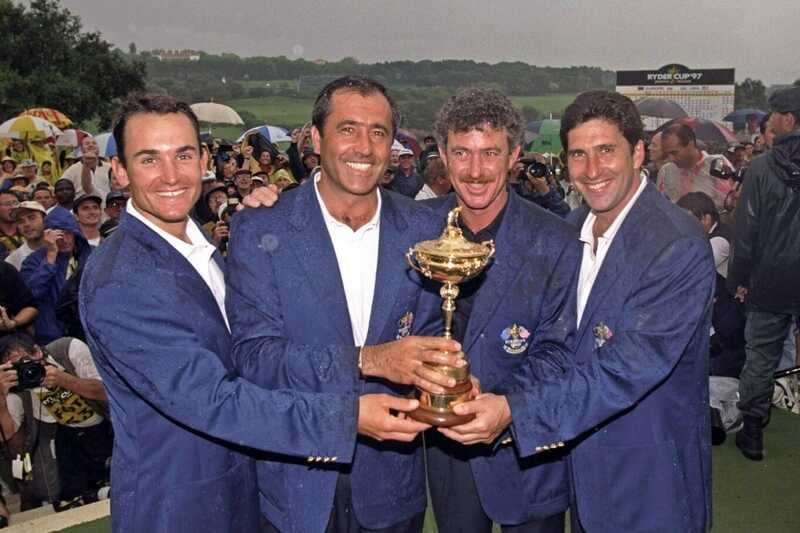 They blend well together and are coming over as a group of close friends with a fiery determination to win the Ryder Cup on European soil – something that hasn’t been done since 1993. The most interesting dynamic for me is the inclusion of the old guys, Tiger and Phil as picks on the U.S. team. Tiger, you had to pick on pure form, but I see no rationale for picking Mickelson ahead of a younger in-form player. Yet, Captain Jim Furyk is a wily old dog-fighting pro who has the total respect of his whole team and this is arguably the most formidable U.S. team we have seen in years. The European team are strong at the top and the inclusion of Poulter and surprisingly Sergio with his putting woes returning, are curious. Who will give you more of their blood, the young warriors or older owls? My father always said ‘young blood will die for you when you give them a chance in a team’. Has Thomas Bjorn got the smarts or instinct to pick the right pairings, rest the right players, match up the old with the young? It didn’t work for Darren Clarke last time or Nick Faldo before him – I have my doubts. My doubts are mainly based on instinct, not statistics, but in match-play, as Seve knew only too well, instinct is a critical factor. When Seve captained in Spain he was on his home turf and the crowd were passionately supporting him. Will the fact that the event is being held in France, not a traditional golfing country, for the first time, soften the ‘home crowd’ advantage? What I do know is that this will be one of the most exciting Ryder Cups in years, especially with the ‘Tigre’ roaring back with a bang at East Lake. I think it will be tight and go to the wire on Sunday afternoon. It will then depend on whether the Captains have placed their toughest warriors in the right place on Sunday afternoon and if they have the ‘cohónes’ to get the job done under what is unquestionably the hottest pressure cooker that exists in professional golf.